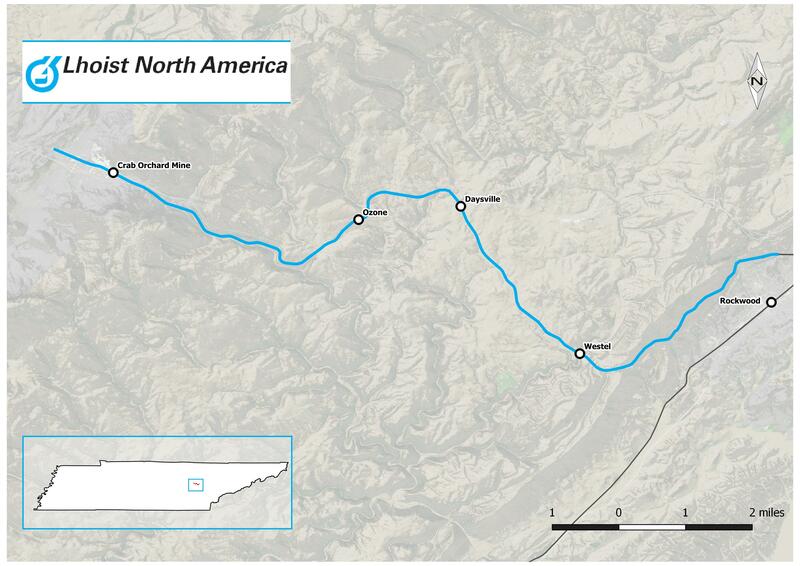 The Franklin Mineral’s railroad operates 16 miles of the former Tennessee Central Railroad between Crab Orchard, TN and Rockwood, TN. 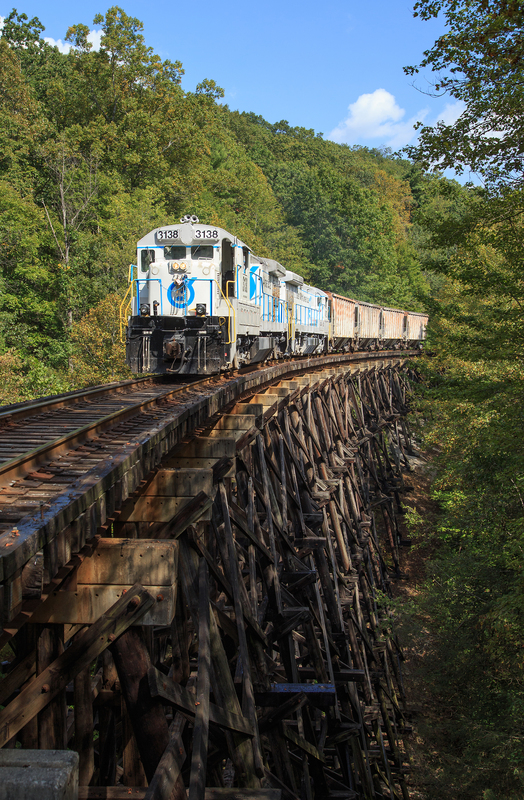 The TC was a shortline railroad that operated between Hopkinsville, KY and Emory Gap, TN, traversing some of the most rugged parts of the western Appalachians on a line full of steep grades and tall bridges. The railroad always struggled financially but finally went bankrupt in 1968. Though an underdog the TC had always proven to be a thorn in the side of the larger railroads providing a shortcut around their longer routes, after bankrupcy the railroad was split between the Illinois Central, Louisville & Nashville and the Southern and then in a short time partially abandoned. The Southern’s segment was first cut back from Crossville to Crab Orchard in the 1990’s and in 2001 NS filed to abandon the entire line. However Franklin Industrial Materials needed the line to serve its quarry in Crab Orchard so purchased it and began operation as a non common carrier, a real oddity in the shortline world. Though not a true railroad the company the owners put on a great image for their new operation and purchased 3 GE B23-7’s, two highhoods from Norfolk Southern and one low hood from CSX, painting them in a striking white and grey scheme with red trim, perfect for hiding the copious limestone dust found in the quarry setting. Franklin was purchased by Lhoist Enterprises, a European aggregate conglomerate in 2006 but it was not until 2013 that the railroads locomotive traded their red Franklin logos for blue Lhoist ones, retaining the same paint scheme. For a history of the Tennessee Central from birth to death click the link to the left to purchased a great illustrated history on Amazon. I first visited the railroad in 2011 and instantly fell in love with the combination of the clean vintage GE’s and the lines fantastic array of wooden trestles. I made another visit in 2012 but then for a number of reasons I did not make it back for many years. Unfortunately in 2015 the railroad leased a former UP GP38-2 which led nearly every train, with that locomotive on the property my interest was significantly reduced. In 2017 the railroad acquired a rebuilt GP35 which I was certain would spell the end of the old GE’s. However in August 2017 the lease unit was sent home and mysteriously the rebuild GP35 disappeared inside the shop. The GE’s had been leading for several weeks so I decided to try for another visit before the EMD returned. 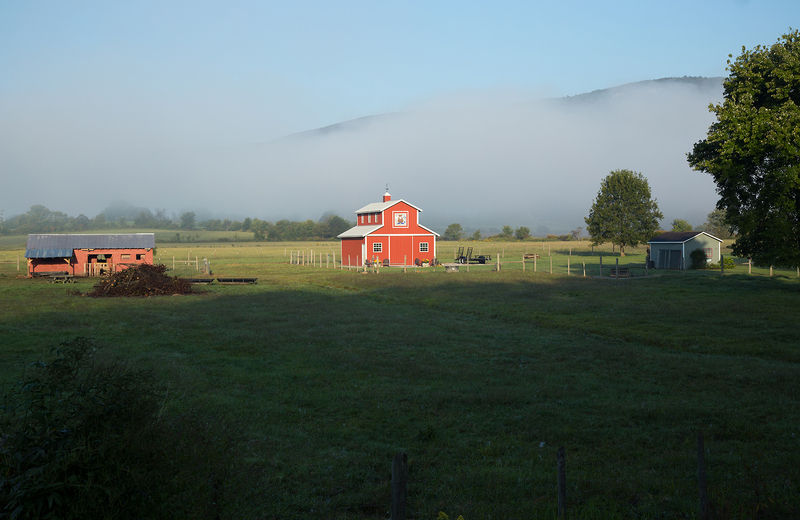 I left Atlanta around 5 AM on Monday September 18th to avoid traffic arriving in Crab Orchard just after 830 central time. Immediately I sensed something was wrong as only one of the highhood GE’s was visible and the lowhood GE was parked by the shop with engine doors open. Did I miss the train? Were they not running? I eventually found the other highhood GE, parked inside the mine complex but after over an hour of waiting I gave up and went to inquire at the office. They indeed would be running but they were having engine problems with the 3138 so the run would be delayed. This would actually work to my benefit as several shots require a later run for good lighting. Not knowing how much work they had to do before departing I decided to forgo the shots at the mine and go ahead and hike into the second trestle south of Rockwood (the first is basically inaccessible). The climb is not too bad and there is a convenient pull off but not something one wants to do knowing the train is bearing down on them! After about a 30 minute wait the train arrived and the chase was on! Below are the photos from the outbound chase. The TC was known for being a mountain railroad and the segment from Crab Orchard to Rockwood was the most difficult to build on the entire railroad. 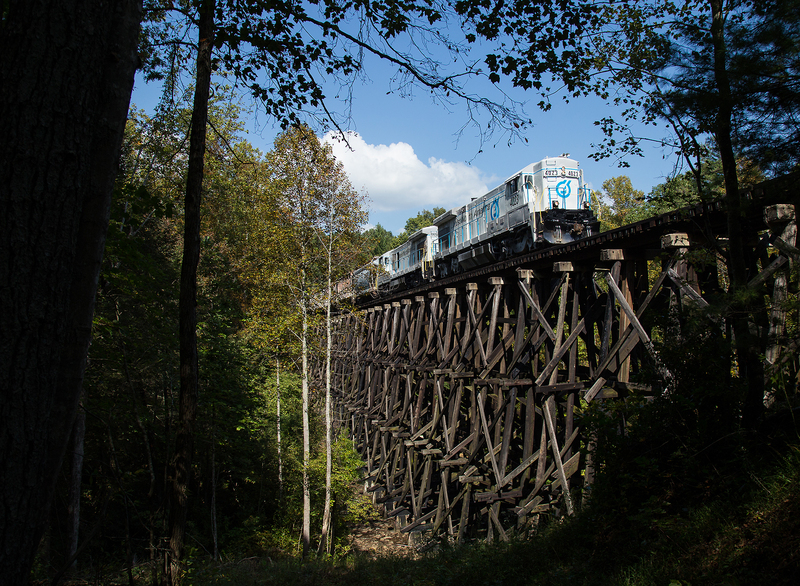 In these 15 miles the railroad crosses 11 bridges, the majority of them being wooden trestles. 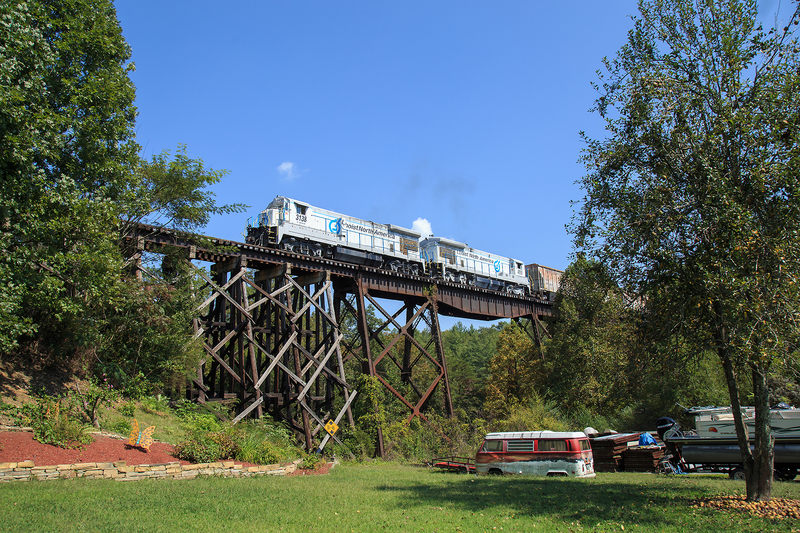 The biggest bridge by far is the nearly 600 ft long steel bridge at Westel which soars high above Piney Creek. 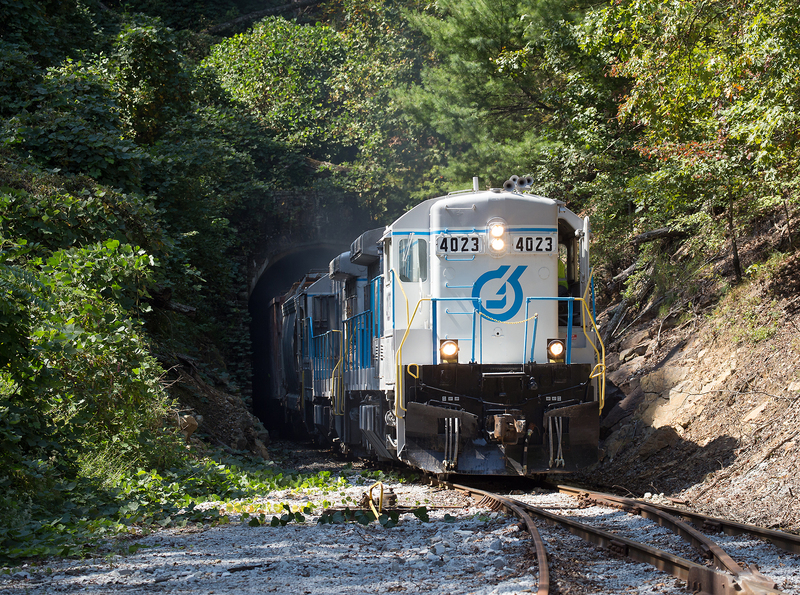 The railroad also traverses the TC’s only tunnel at Westel, the approximately 550 foot long Cumberland Gap tunnel. Chasing this line is relatively easy but getting back to several of the bridges can be difficult. 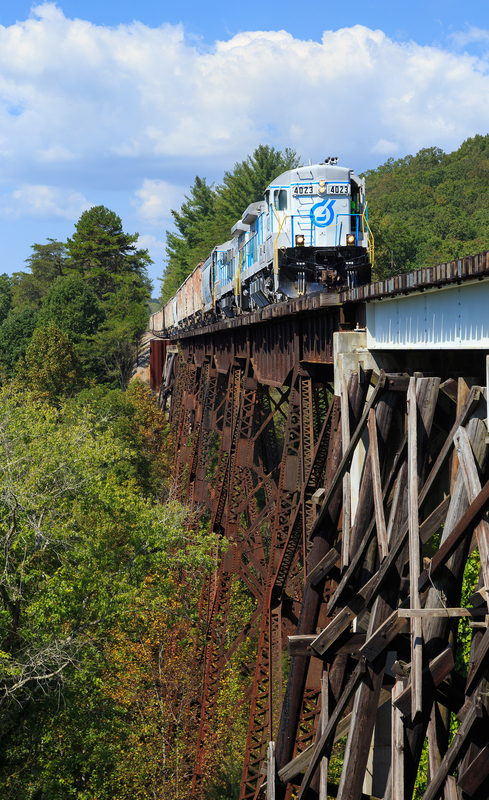 For the most part the tracks follow US route 70 and trains rarely move faster than 10-15 mph due to the steep grades. A few like the bridge pictured two the left can be accessed by climbing up from the road while others require a several minute hike back like the trestle below. My favorite shot of the day, crossing “Mammys Creek” near Daysville, TN. This bridge requires a bit of hiking to reach but was worth it for the rare late run, the shot from the other side is not nearly as impressive. 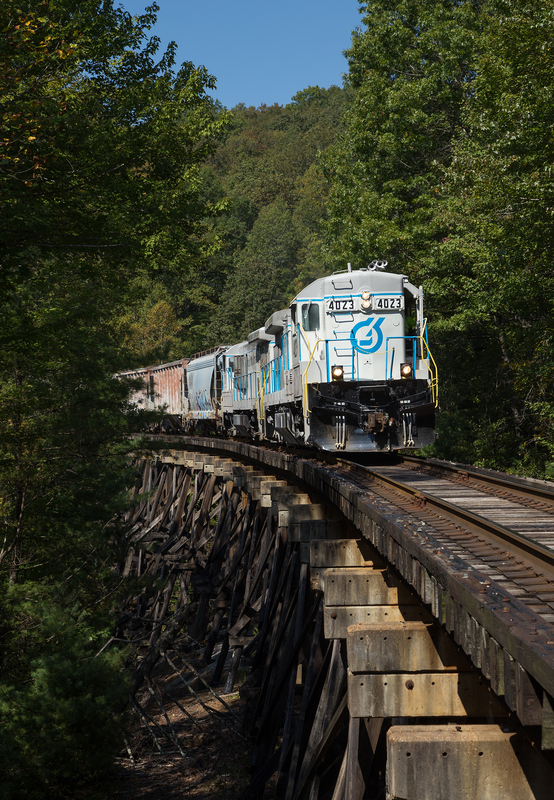 At Westel the railroad crosses its tallest bridge and then plunges into the Cumberland Escarpment tunnel in short succession. 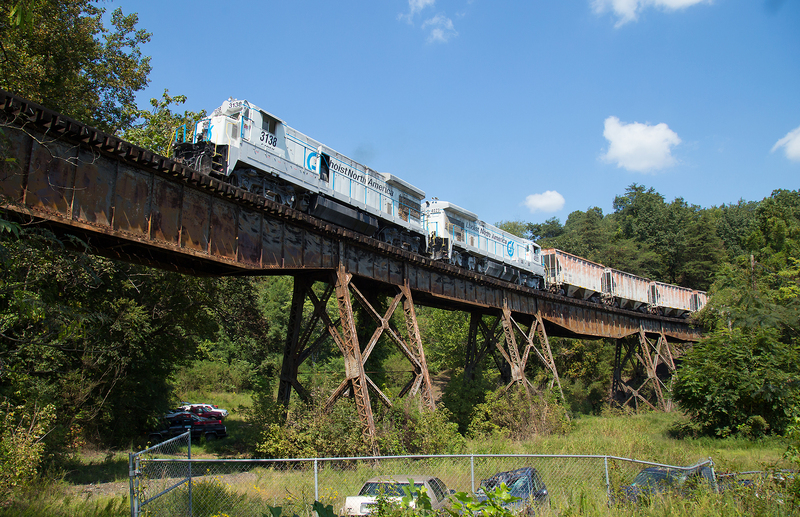 The adjacent highway 70 bridge provides a good if increasingly tree obstructed view but having done that many times I opted for a track level view which involved climbing the steep embankment then running down quickly to beat the train to the tunnel. Of note the CST to EST divider runs right through the middle of the bridge so the rear of the train is in Central time and the head in Eastern time. At Rockwood the railroad interchanges cars with NS on an industrial siding, the TC shoves their train back into a dead end industrial track and picks up their outbound cars from a run around track where they were left by a NS train out of Emory Gap. 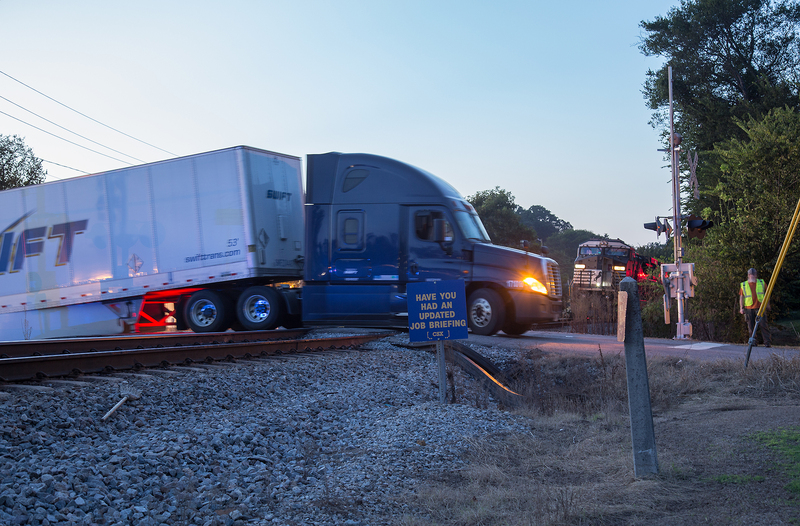 The TC continued all the way to Harriman, TN but NS retained the portion between Harriman and Rockwood to serve other customers. 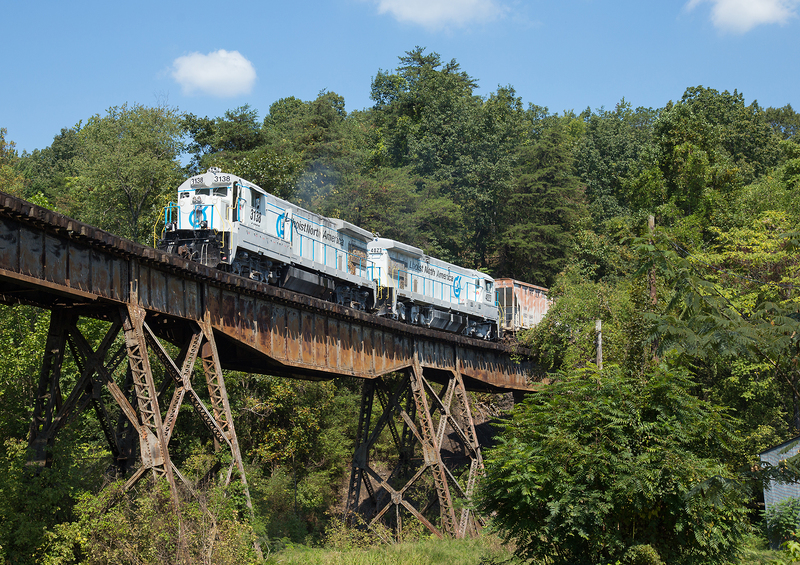 After picking up their outbound train the two GEs begin the climb uphill out of Rockwood, crossing over a curved steel bridge. At one time the junkyard that I am standing in was home to the Roane Iron Company which mined coal and iron ore which was found in the ridge above Rockwood, a narrow gauge that transported these raw materials to the coking ovens once passed underneath this bridge. Crossing over the bridge at Westel westbound, the approaches on this side have yet to be replaced with concrete. The light angles are limited on the westbound chase but I knew the curved bridge where we started the day would be good light and a new shot for me as on my previous trips the train was too early for good light at this location. It was a close call with some small clouds but the train came in sun and with that I was happy to call it a day and there would be few places to photograph the train before Crab Orchard anyways. 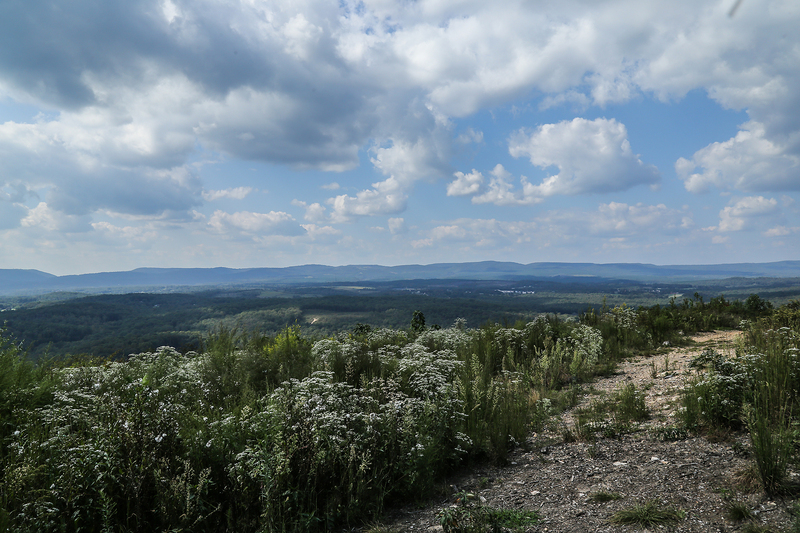 I headed back down to Rockwood and stopped to check out the Mount Roosevelt overlook, the road to which passes over the top of the tunnel at Westel. Unfortunately like many overlooks no one tends to the trees so there was only a tiny gap in the tree cover which did provide a nice view of downtown Rockwood. Some clearcutting on the other side of the mountain actually opened up another vista of the surrounding mountains. 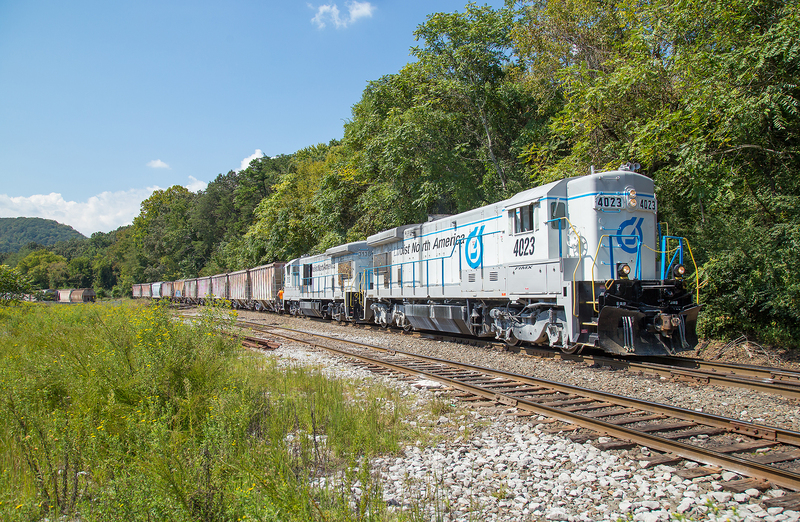 From Rockwood I followed the NS CN&OTP back towards Chattanooga, there were plenty of trains but unfortunately they were all northbound so the light angles ranged from bad to terrible. 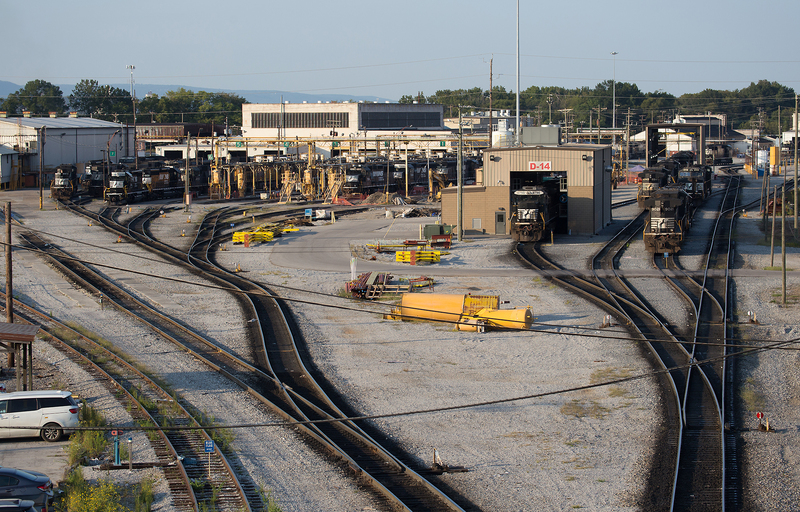 My luck was worse in Chattanooga where I barely missed a train passing a set of signals I had spent 2 hours trying to shoot a few weeks before. I’d rather have spent my luck on FIMX so drove home only slightly disappointed. On a whim I decided to get off at Emerson, GA to see if there was a train in the siding as there often is, instead I pulled up to flashing blue lights and a semi trailer stuck on the crossing, a seemingly common occurrence around Atlanta with the combination of steeply graded railroad crossings and illiterate drivers. Two trains were stopped short of the stuck truck and I decided to stick around and watch them tow the truck off the tracks and let train traffic resume. A rather strange but interesting end to a good day. 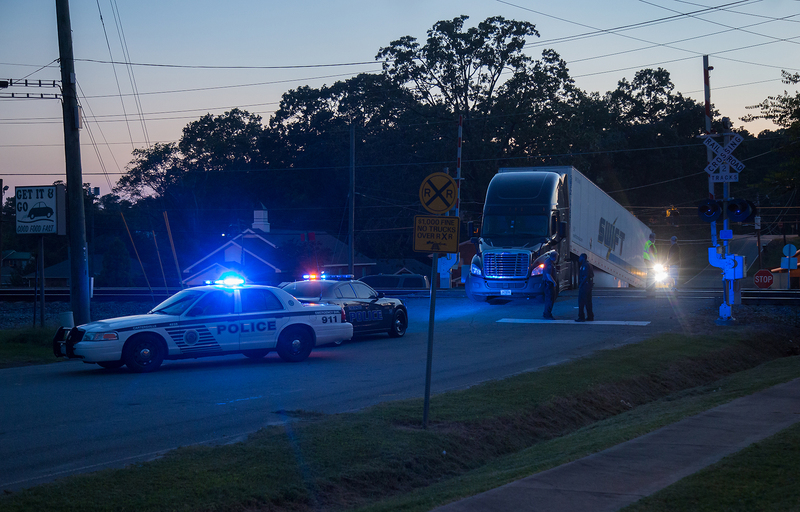 Police guard the Gaston Westbrook Ave crossing in Emerson as they wait for the tow truck to remove the stalled truck. 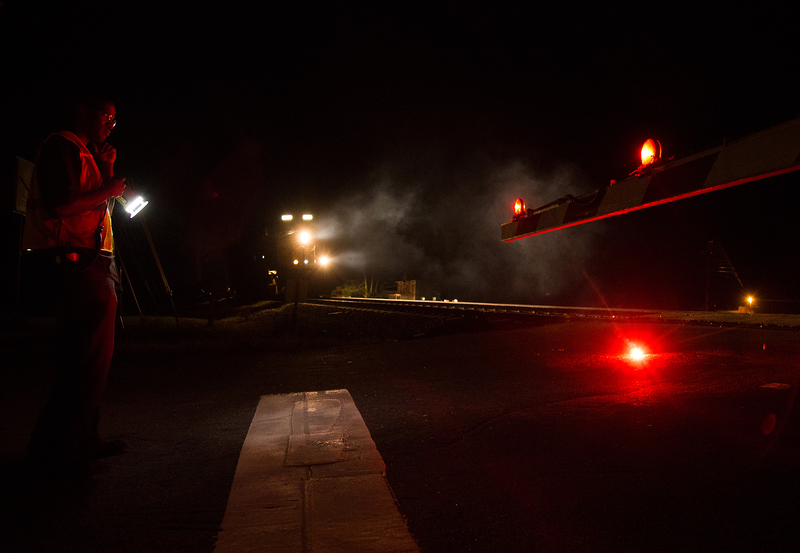 After the truck was removed a stop and flag order was put out incase the crossing systems were damaged. Hot intermodal train Q028 slowly pulls forward as the conductor flags the crossing. Wonderful page on this unique train. 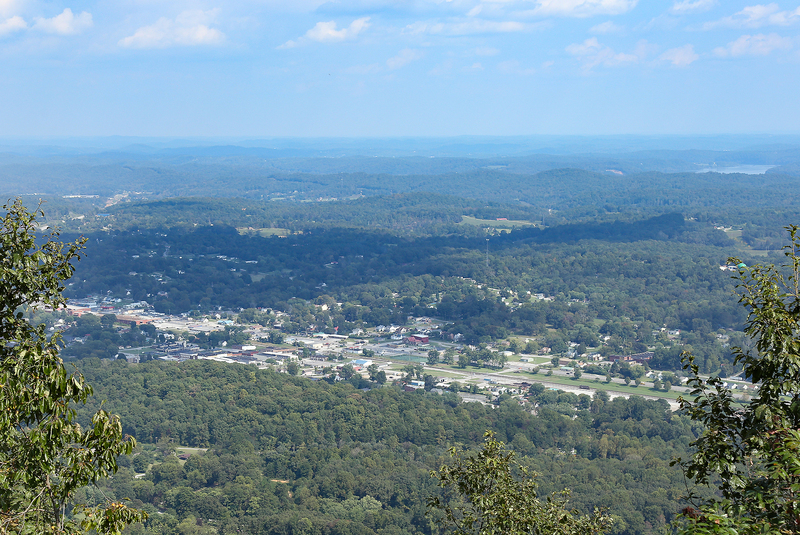 I live in the Crossville area and am hoping to replicate some of your shots. When you said, “… the chase was on,” does that mean you shot these in one run of the train? Did time allow you to drive ahead and catch the train as it passed the various features? Thanks. Hi Craig, sorry for the delayed response. Yes you can take all of these on one run, the train only runs 10 to 15 mph so its possible to do all of these if you can climb up and down the hills quickly. Its very easy as far as train chases go. Best of luck! An interesting note: Trying to get a better estimate of when the train runs, I asked a friend if he knows anyone who works for Lhoist (formerly Franklin Limestone). His answer floored me: “No, but my brother-in-law employs a man part time who works there. Well, he doesn’t actually work for Lhoist — but he drives the train.” So now I have the phone number for the train engineer! Now the wet weather has set in. Hopefully it will dry out enough to do this in the spring. Hey Craig, thats too bad, it used to be a bit more predictable in past years. This time I waited almost 3 hours if I remember right because they had some locomotive problems. They usually spend some time building the outbound train on a normal day anyways. Very cool that you got the engineers number, hopefully will be easier for you to catch them running now!